Freemantle and Shirley in Southampton, UK is our Community. The Field we support is listed as Open Space. 25,000 people live in our Community area. The Field is nearly 8 Acres in size and is Green Field on the Local Plan as reference CLT3. The Field used to be well used by all the Community since the 1800, even during it's ownership by the Civil Service it was well used until it started losing money and the Civil Service allowed the site to fall into rack and ruin. Vandals burnt down the Social and Sports Pavilion, and some trees, and the Council has now cleared all the ground and removed the logs and reseeded. Our Association seeks to save this huge green field area and to return it's use to the Community. We are campaigning the City Council to help us do this. Please help us to help you. 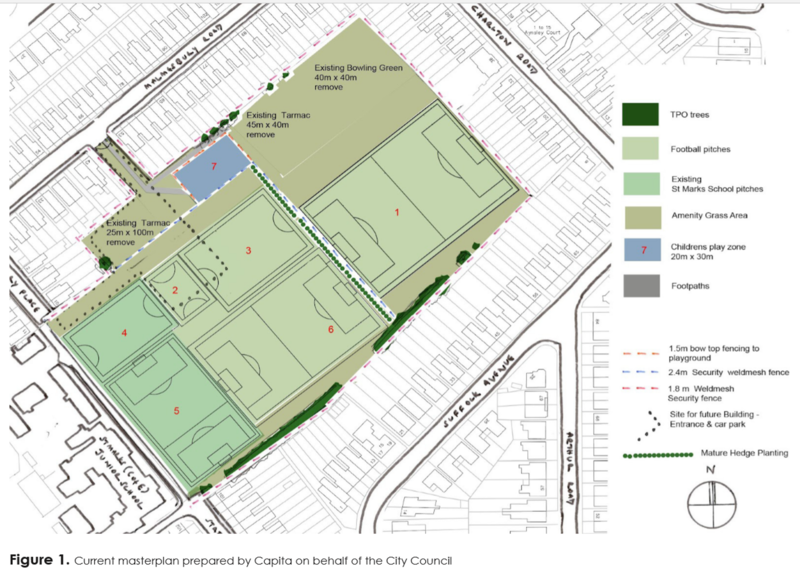 The City Council has compulsory purchased The Field in 2012 and aims to return it to the local schools and community. Do you have ideas on its use and what uses you would like to see, and be involved with, on The Field. This is only one of our 2013 ideas. Click for 5 Mb file. The council has some ideas and others in the community have theirs. Some of the Council's documents. Invitation. Design idea. History of purchase. What do you want? Public Consultation organised by FOTF to be held on Friday 28th July 2017 7pm-close at Freemantle United Reform Church Hall, next to Carwash on Shirley Road. Come and meet others. Join in..
We also organize Southampton's Foyes Corner Festival - 3 great events so far with 1000's of local residents attending a free community festival for all people of all ages. Join us and be a part of the legacy. One possible Field idea shown below..... Note: This is not proposed. This is just an idea to generate further ideas, thoughts and feedback. There are many many ideas. A photo of a lonely toy in 8 acres of playing field gone to ruin. This could be a thriving sports, social and playing field with YOUR help.